(Note: I may have an unfair advantage in reading Horne’s story. iron and hardwood desks, dipping imaginary quills in the inkholders. with, but for the superb structure of the piece. Gunn (or the poem at least) was a strong influence in Horne’s growth as a writer. stars, Horne’s those who are no longer here are diametric opposites of Gunns. certain amount of genius in Horne’s structure. mirror images of each other, flipped. in Horne’s story, the gone exert ever more and more influence. mentions suggest hundreds of more pinwheel branches. market mainstream literary story, which is how it reads on the surface, complete to the Gunn epigram. to be. A very ambitious and accomplished story! Utah’s Uintah Basin was the last area opened for homesteading in the lower 48 states (1905). My grandfather was one of the original homesteaders (arriving in the then remote area by wagon). The senior citizens in the ward I attended in school were original pioneers of the area. There was a small cave on my uncle’s place, about the size of a living room and tall enough for a twelve-year old to stand up straight in that my cousins had dragged several old school desks (from the original one room schoolhouse) into; we played “school” in there often during my summer visits, sitting on those wrought iron and hardwood desks, dipping imaginary quills in the inkholders. Horne’s story is an amazing tour de force, not only for the rural Arizona ambience I can readily identify with, but for the superb structure of the piece. Luisa Perkins was quite correct; Thom Gunn’s “My Sad Captains” is very much a key to understanding “The People Who Were Not There.” Horne would have been in his late twenties/early thirties when Gunn relocated from the UK to San Francisco in the 60s and penned Captains. I suspect Gunn (or the poem at least) was a strong influence in Horne’s growth as a writer. Much of the story reads like a response/enactment of Captains. 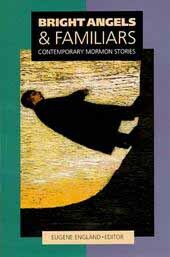 Except Gunn’s poem puts a widening distance and deepening withdrawal of influence between the dead (those who are no longer here) and the living, while Horne’s treatment is a very Mormon-centric view of the tangled, unbreakable interactive bonds between mortality and (those who are not here) on both sides of the veil (pre-mortal and post-mortal). Aside from a brief tweak mentioning the D.C. monuments lighted by hard flame-fed energy, like the stars, Horne’s those who are no longer here are diametric opposites of Gunns. I’m one of those who plots stories visually, either by storyboarding or abstract diagramming. Reading through Horne’s story gives one a sense that it seems meticulously structured. Diagramming shows a certain amount of genius in Horne’s structure. The story is perfectly biometrical ““ the Arizona portion and the Richmond airport/airplane portion are mirror images of each other, flipped. The Narrator is the center of an ever-expanding pinwheel of the past impinging on the present. The Narrator is connected to the present by Those Who Are Here who are themselves connected to the past (locale and people) by Those Who Are Not Here. The exact opposite of Gunn’s poem (“They remind me, distant now”): in Gunn’s poem, the dead and gone exert less and less influence as the poem progresses; in Horne’s story, the gone exert ever more and more influence. Horne follows two branches of the pinwheel in each of his two story halves. The Arizona “top half” extends through grandfathers but strongly suggests further links up the chain past them. The Richmond “bottom half” extends through infant children (again suggesting further links). Horne even suggests another pinwheel branch, mentioned, but not examined, in each half: the pre-farm life in the Arizona portion; the Washington monument historical past in the Richmond section. These brief mentions suggest hundreds of more pinwheel branches. Horne did something amazing, I think. He structured “The People Who Were Not There” as a national market mainstream literary story, which is how it reads on the surface, complete to the Gunn epigram. But at its deeper level it’s a wicked subversive Mormon-worldview direct refutation of what it appears to be. A very ambitious and accomplished story! Fascinating, Lee. Thanks for submitting this. Oh, I love the pinwheel. I think this analysis works brilliantly. Ack! The word I mean to use was “bisymmetrical” not biometrical etc. Sorry for the typos. Bit distracted here. We’re experiencing hurricane force winds here on the Oregon Coast (just a typical winter storm), power keeps going up and down, and I spent yesterday battening down hatches and yard gnomes in between typing AMV paragraphs. Thank you, Wm. and Luisa. I should also mention that it Horne made another dichotomy betwen the Arizona “top half” and the Richmond “bottom half”: length/brevity/style. The Lost Generation-era Arizona top half is much longer. It goes deep into descriptive-rich passages. It’s written almost as if channeling Maureen Whipple. The modern-day era Richmond bottom half is terse, brief, description-deprived. Hemmingwayesque, if you will. I think this was a conscious stylistic choice on the part of Horne, but it also serves a practical purpose. If, as I think he did, Horne wrote this for mainstream literary publication, his readers are very familiar with the Richmond modern day milieu; not so much the Momron Arizona cottonwood milieau. Horne focuses on details in the Arizona portion because it is so alien to his intended audience. For the Richmond section, he doesn’t have to, so doesn’t. If you draw a straight line from Neola to Bluebell, familiy farm is about at the two-thirds to Bluebell mark. Oh, wow. That’s rural, even for the Basin. Thanks, Lee. I don’t tend to diagram stories this way (even my own), so I doubt this would ever have occurred to me. I think, though, that it confirms what I originally thought the story was about. On a personal note, this story made me really think about the people who ‘aren’t there’ in our lives. I have a brother-in-law who died when his daughter was only one year old. So my niece has a father that she is sealed to, and yet does not remember at all. My children have an uncle they have never met (well, and many other relatives they haven’t met). Because of our belief in an afterlife, and particularly in family sealing and an eternity as some sort of family group, we are in some ways ‘haunted’ by our ancestors that are both ‘here’ and ‘not here’. I have sometimes wondered about these reunions beyond the veil; will it be awkward to reunite with the father you never knew? In an eternal scheme, earth life is short, but will 60 or 70 years of earth life without someone make an eternal life unusual? I don’t know. I can see a doubling of this concept in the story with the idea that we have, in some sense, past lives that are not what people meeting us know will ever see. We are also made up of past ‘selves’ that are ‘not there’. Like the grandfather who had once been a missionary in Samoa, and whose grandson could not reconcile the man he knows with the man who was. Or the woman who has children but who no longer ‘has’ children here on earth.